Amazon can restrict sellers from selling certain items. These items are called Restricted Items. The program will notify you if an item is restricted to your account. Click ‘Menu’ -> ‘Restricted’, the program will open restricted items screen. (1) The program will not notify you if the item is restricted or not. (2) The program will ask you to login to your Amazon account when starting, and it will notify you if the item is restricted or not. (3) Allows selection of categories in (4). 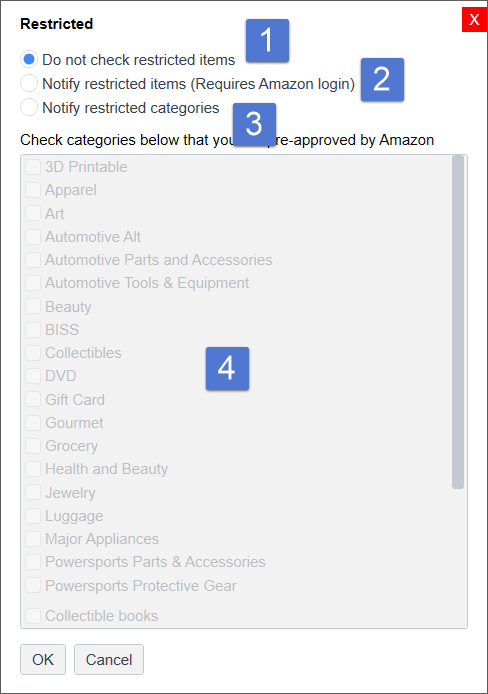 The program will notify you if the item is from the selected categories. We recommend you select (2).